Night blindness, the inability to see in dim lighting, is a fairly common symptom of degenerative retinal diseases such as retinitis pigmentosa. But did you ever hear of “day blindness”? 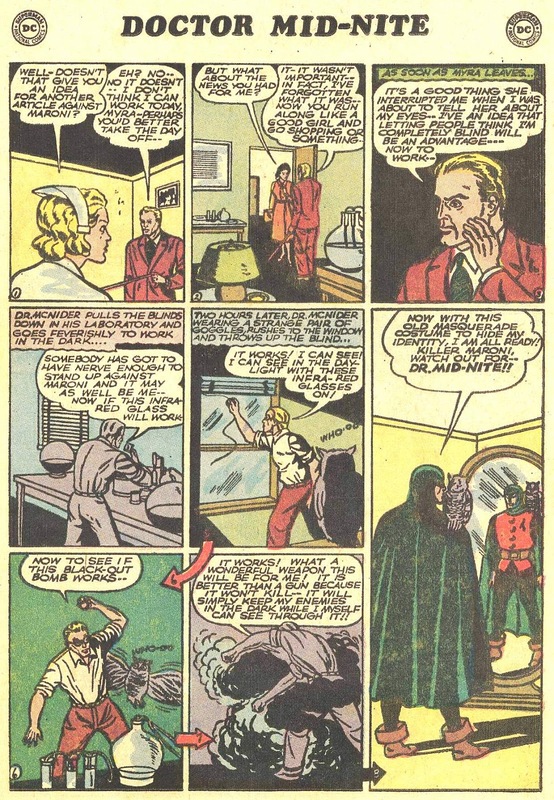 This is the strange condition of Dr. Mid-Nite, a golden age DC character, who predated Daredevil by two decades to become the first blind superhero. Ironically, there’s of course also a sighted golden age superhero by the name of Daredevil, so I guess I’ll have to get to him too at some point. Involved in a strange explosion when called upon to examine a mob informant by the name of Brown, accomplished physician Charles McNider is struck blind. Through a strange chain of events he later realizes that he is now able to see in complete darkness, while being totally blind when light is present. Does that sound strange to you? Yeah, me too. Page 6, from All-American Comics #25. Aside from being able to take advantage of the darkness, Dr. Mid-Nite has something else in common with our very own Daredevil. Dr. Mid-Night focuses primarily on street-level and organized crime, rarely encountering costumed foes. While silver and bronze age Daredevil generally fought other costumes, the modern character, since Miller and onwards, has undoubtedly fallen into the same vein as his blind predecessor. What sets them apart, aside from their sense of fashion, is primarily how their abilities work. With his rigorous physical training, heightened senses and radar sense, Daredevil is clearly the more powerful fighter. Dr. Mid-Nite is really only at an advantage when his opponents see less than he does and is consequently much less versatile. On the other hand, and rather ironically, Daredvil is always blind. While most characters in the “superhero with disability” category either escape their physical predicament when powering up (i.e. when Donald Blake becomes Thor) or rely on some sort of equipment to render it completely inconsequential (i.e. Dr Mid-Nite or any character that sports a prosthetic more powerful than the original missing limb), Daredevil is not so lucky. Aside from his powerful and largely – though not entirely – compensatory senses, Matt Murdock doesn’t get the benefit of an easy fix. For those who want to read more about Dr. Mid-Nite, I recommend his Wikipedia page, and this blog post by Diversions of the Groovy Kind. Otherwise, I agree DD completely out-airwolves Dr Mid-Nite but I’ve read somewhere he had fans thinking he would totally own DD in a fight (they’re nuts). Oh, yeah. Read that too. I wonder if he intends before or after DD pounds his nervous centers/pressure points to nothingness.